The last thing a colleague at work said as I headed for the door ready to start my holiday was “Try and relax”, not something I'm very good at in general. Portugal in the summer is hot, sunny and laid back, especially where we were staying (Vila Nune) so I didn't think I would have too much trouble. However, the start of the journey was typically eventful. When I say that I mean I am a Sherlock so little things go wrong; a last minute diversion to Morrison’s on the way to the airport for tea bags are a classic example of what my life is like. On arrival at Porto airport the car we had hired was so smashed up we couldn't have it so we ended up with a much smaller car that, luckily, I could get all the bags in while still managing to fit the wife and children in. It was late by this time and I was tired: It would appear so was the Sat Nav and we couldn't find the turning off the roundabout for love or money and even found ourselves about to head back onto the toll road until a kind local who spoke no English helped us reverse back up the road before removing whatever spell was hiding the correct exit so we could be on our way. Unfortunately, I had already panicked at the toll and driven through the camera bit that means I couldn’t pay for the ticket so would have to phone and pay later. Many minutes on my mobile later both the hire car company and the toll people said “wait for a notification”. I'm guessing that's Portuguese for 'fine' though one quote also said “if they can be bothered to send it”. When we eventually found the villa, sometime around midnight, it was stunning. A little bit of unpacking was done while the kettle was on i.e. find those emergency tea bags from earlier, and we sat on the terrace drinking tea and staring at a moon-lit mountain opposite. I wish I had taken a picture as I've not managed to stay up long enough to see the moon again because it hides behind the mountain for quite a while. The next morning we woke early (or I did) to stunning views and a pool that appears to be a trap for all things nasty: 1 scorpion, one lizard and at least 5 centipedes of about 10cm in length. Plus ants of all sizes, some of which would be scary looking if shown on Primeval! 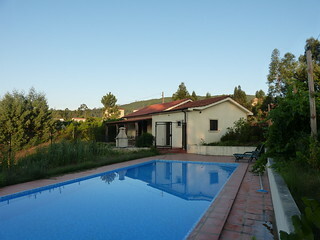 Once hoovered and the filter changed the pool is amazing and the most used (other than the kettle) part of the villa. The downside to Vila Nune though is definitely the dogs and their incessant barking as soon as it goes dark. If I ever come back I will be either starting a new religion where any dog that barks after 9pm is sacrificed to the STFU God (loosely translated as the God Of Quiet), or smuggling in a silenced pistol and some night-vision goggles. They bark and howl all night and then spend the day asleep in the middle of the road so you have to go round them (the excess on the car hire is far too much to run the bastards over, no matter how tempting). I could also do with learning the language; Portuguese reads like Spanish but sounds like an Eastern European language. No matter how hard you try the only word you can remember is obrigado/a for thank you and even then you mess up the gender! Anybody that knows me will be smiling to themselves when I hat not being able to communicate - it didn't stop us visiting places but it curtail some of the exploring in case somebody tried to talk to me (they speak little to no English and it's just embarrassing how little Portuguese I could master). This was highlighted daily when the bread man arrives (07:45 every morning) and I smile, point and shake hands a lot to buy what must be the cheapest bread in the world.